EL CERRITO, Calif. -- In some ways, Rainbow Day Camp is very ordinary. Kids arrive with a packed lunch, make friendship bracelets, play basketball, sing songs and get silly. But it is also extraordinarily unique, from the moment campers arrive each morning. At check-in each day, campers make a nametag with their pronoun of choice. Some opt for "she" or "he." Or a combination of "she/he." Or "they," or no pronoun at all. Some change their name or pronouns daily, to see what feels right. 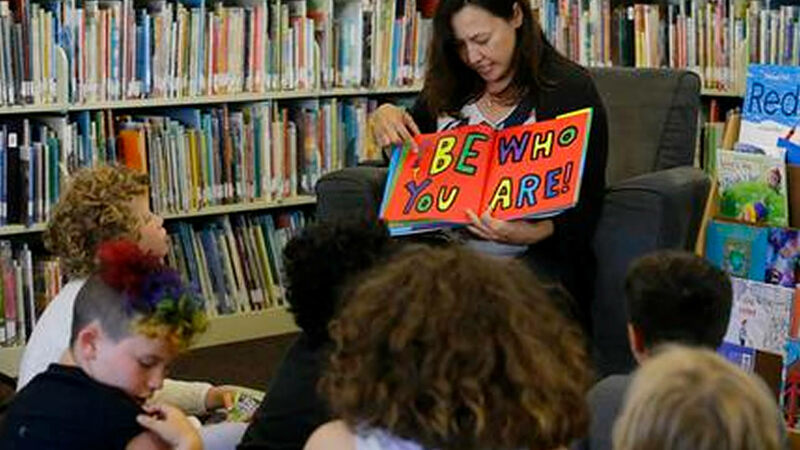 The camp in El Cerrito caters to transgender and "gender fluid" children, ages 4 to 12, making it one of the only camps of its kind in the world open to preschoolers, experts say. Enrollment has tripled to about 60 young campers since it opened three summers ago, with kids coming from as far as Los Angeles, Washington, D.C. - even Africa. Plans are underway to open a branch next summer in Colorado, and the camp has been contacted by parents and organizations in Atlanta, Seattle, Louisiana and elsewhere interested in setting up similar programs. On a sunny July morning at camp, the theme was "Crazy Hair Day," and 6-year-old Gracie Maxwell was dancing in the sunshine as a Miley Cyrus song blasted from outdoor speakers. The freckled, blue-eyed blonde wore her hair in a braid on one side, a pigtail on the other and snacked on cereal as she twirled and skipped. "Once she could talk, I don't remember a time when she didn't say, 'I'm a girl,'" said her mother, Molly Maxwell, who still trips over pronouns but tries to stick to "she." "Then it grew in intensity: 'I'm a sister. I'm a daughter. I'm a princess,'" Maxwell said. "We would argue with her. She was confused. We were confused." "I see her now, compared to before. I watch her strut around and dance and sing and the way she talks about herself. If she was forced to be someone else," the mother trails off. "I don't even want to think about that." Gender specialists say the camp's growth reflects what they are seeing in gender clinics nationwide: increasing numbers of children coming out as transgender at young ages. They credit the rise to greater openness and awareness of LGBT issues and parents tuning in earlier when a child shows signs of gender dysphoria, or distress about their gender. "A decade ago, this camp wouldn't have existed. Eventually, I do believe, it won't be so innovative," camp founder Sandra Collins said. "I didn't know you could be transgender at a very young age. But my daughter knew for sure at 2." Collins' experience as the mother of a transgender girl, now 9, inspired her to start the camp, and another for 13- to 17-year-olds called Camp Kickin' It. "A lot of these kids have been bullied and had trauma at school. This is a world where none of that exists, and they're in the majority," Collins said. "That's a new experience for kids who are used to hiding and feeling small." Fourth grader Scarlett Reinhold, Collins' daughter who was born a boy, says at camp she can be herself. "I feel comfortable for being who I am and who I want to be," says Scarlett, a confident 9-year-old in a frilly skirt who wears her dark hair long and wavy. The favored protocol today is known as the "gender affirmative" approach, which focuses on identifying and helping transgender children to "socially transition" - to live as the gender they identify with rather than the one they were born with until they're old enough to decide on medical options like puberty blockers and later, hormone treatments. The Center for Transyouth Health and Development at Children's Hospital in Los Angeles, started a decade ago with about 40 patients, now has over 900 people, ages 3 to 25, enrolled in its program, with 150 on its waiting list, said Johanna Olson-Kennedy, the clinic's medical director. "I just think there's a lot more openness to the understanding that trans adults start as trans kids," Olson-Kennedy said. "When people say, 'Isn't this too young?' my question back to them is, 'Too young for what? How young do people know their gender?' The answer to that is some people know it at 3, and some people know it at 30." Diane Ehrensaft, director of mental health at the University of California, San Francisco's Child and Adolescent Gender Center, says enrollment there has tripled over the past few years with a "sea change - maybe we can even call it a tsunami - in the number of little kids showing up with their families." Studies show transgender adults have higher rates of suicide and depression than the general population. A 2016 study by the University of Washington's TransYouth Project, published in the journal Pediatrics, found trans children who live as their preferred gender and are supported by their parents have the same mental health outcomes as other kids their age. "I want to show these kids what a confident, happy, successful trans person looks like," said camp director Andrew Kramer, 30, who goes by AK and came out as a transgender man at 26. "We teach them they are normal, deserving of love, and not alone." Nao's mother, Miriam, said she watched her child blossom at camp. Nao was happier and less prone to outbursts, made friends, opened up about school bullying, and wants to return next summer. "I think for the first time, (Nao) feels like just a normal kid," Miriam said. Before flying home, she said, Nao wrote a note to the camp's counselors. It read: "Thank you, for making me feel so happy." For more stories and videos related to the transgender community, click here.